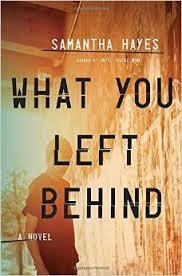 I remembered reading some news stories about some clusters of suicides among young people in a Welsh town, and was intrigued that the plot of the book What You Left Behind seemed to focus on the same type of phenomenon. Detective Inspector Lorraine Fisher comes to the sleepy rural English town of Radcote to visit her sister, Jo. Radcote was the scene of a rash of suicides among young people a few years previously, and recently it seems as if the cycle is starting up again. Jo, who has a history of expecting Lorraine to bail her out of trouble, is separated from her partner and has an 18 year old son, Freddie. Freddie is moping about, being generally moody and uncommunicative, but it turns out his behavior is due to more than growing pains. For several weeks, he's been the target of a particularly nasty online bullying campaign. He hasn't told anyone about it, but he is becoming increasingly disturbed by it. Jo is close to some people in town, Tony and Sonia Hawkeswell, whose son Simon recently committed suicide. Sonia tries to overcome her grief by working at the local homeless shelter, and she's browbeaten her daughter Lana into also volunteering there. Sonia has decided that Lana is going to become a doctor and that volunteering will look good on her university applications. Their household is also made up of Tony's autistic brother, Gil. Gil lives in a separate building from the main house, but is pretty much involved in everything the family does. He's also an extremely talented artist. When Lorraine sees a drawing he made of the scene of another supposed suicide, she becomes convinced that all the new suicides might instead be foul play. I really wanted to like this book, due to the setting and intriguing premise, but it was too annoying to be enjoyable. All of the characters seem to be harboring secrets, which they refuse to tell anyone, but which could likely be easily remedied if they would just SAY SOMETHING! You know it's all going to come out in the end, so why keep going over and over how, for instance, Freddie just *can't* tell anyone about the bullying because "that would make it worse." Just how exactly, we never hear. It's not that Freddie is embarrassed about being targeted, or afraid of physical harm -- his reasoning is that the non-stop online abuse "will get worse." Um, OK . . . As the various characters are wrestling with their secrets which they can't tell anyone, they seem to continue to have the same conversations over and over (especially Freddie and Lana). Nothing ever gets sorted out and they continue to cover the same useless ground over and over, chapter after chapter. The author does try to throw in a few red-herrings to point us toward several suspects, but I'm still not very clear on why some of the suicides were arranged to look like murder. By the end, we know who the supposed murderer was, but the motivation is still murky. There are also lots of forged suicide notes, false confessions to crimes and contradictory statements (in one chapter Lorraine has read a supposed suicide note, in the next she's wondering what was in the note) which don't really add up to a cohesive and enjoyable story. The novel ends with something that is supposed to be a shocking twist, but by that time I'd long since stopped trying to make any sense of what the characters were doing and why.